Goodnight Madison marks an exciting turning point for one of Chicago’s hardest working bands. 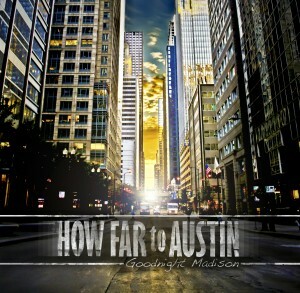 HOW FAR to AUSTIN (HFTA) has been a well-respected name in the Chicago music community for several years thanks to a tireless touring schedule and a uniquely entertaining “Rock n’ Soul” style. Working and playing alongside them the past couple years, I watched HFTA find success building its audience via classic but uncommon means. 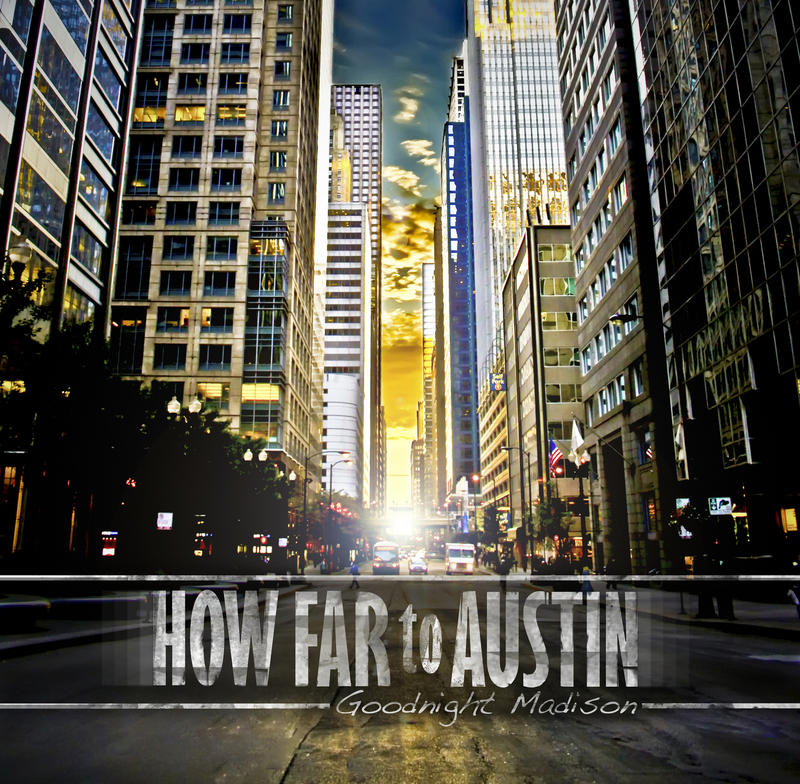 Unlike most indie acts, HFTA tours regionally as a full 7-piece band or simply a trio (guitarist/songwriter Tate Troelstrup with lead singers Derrick Mitchell and Katie Troelstrup) with a large, ever-changing catalog of crowd-pleasing cover songs. 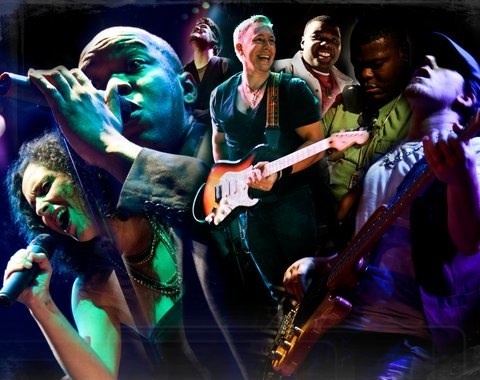 OK – time for some severe generalizations and oversimplifications: For better or worse (I’d argue worse), many suburban music venues around Chicago will only book cover bands on prime nights. In a chicken/egg type scenario, suburban bar-goers have come to expect to hear songs to which they can sing along. HFTA has been able to make lemonade from this somewhat depressing reality – hooking suburban audiences with great, fun songs they recognize and reeling them in with equally well-performed and energetic original material interspersed throughout the set. This model has given them access to suburban markets and ultimately made them many, many new fans of their own stuff. More fans, more better-paying gigs, a ton of fun – everybody wins. There are, however, some unintended consequences to this model. When I got to see HFTA just before I moved to Seattle, their home-town Chicago set was overloaded with too many covers for my taste. It was a great show – don’t get me wrong – but as a fan I was excited to hear their music and did not get enough. I can appreciate the dilemma – with so much time, effort, and excitement put into those great cover songs for all the suburban gigs it would be difficult NOT to share them all with the hometown crowd. But in a 50 minute set it just didn’t feel right to me. It felt like they were selling themselves short. I was worried HFTA would go the way of the cover band. In this record, I hear HTFA’s classic Rock n’ Soul sound converging with a pop sensibility learned from playing for people, night after night, bar after bar. I hear Tate Troelstrup’s increasingly-catchy songwriting drawing implicitly from the experiences of being a working, touring entertainer. The songs aren’t about being a musician, but great choruses like “Baby you’re all I need tonight / A little something more than just a vision in the barlight,” are laced with realities of their lives over the last few years. Singers Derrick Mitchell and Katie Troelstrup work together to drive it home with passion and honesty. Perhaps most significantly, HFTA was not afraid to put on a sparkling, glossy pop finish. Producer/engineer Steve Gills (Filter, Naked Raygun) pulled no punches when it came to tight harmonic layers, digital effects, and catchy breakdowns in all the classic places. This will not win them points with the hipsters, but it was absolutely the right call. Plus, the hipsters were never listening anyway. Ultimately, Goodnight Madison is the perfect record for this band at this juncture, and that’s so good to see. The music comes from the heart and will fit perfectly into their high-energy live set. Most importantly, all the folks that bring the album home with them after meeting “that great band they saw at the bar last Saturday night” are going to come back next time requesting these songs and singing all the words.